3 ACRES – Restaurant And Bar Plus 4 Room Hotel In Center Of Ojochal!!! 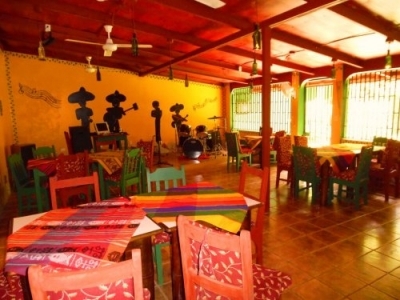 “Poco Loco”” is a newly renovated and recently opened restaurant and bar located in the village of Ojochal. This is a popular destination for locals and visitors alike that provides a comfortable and relaxing atmosphere. The current owners have brought the place up to todays’ standards with installation of ramps for handicapped access, a newly appointed kitchen, and a spacious restaurant. This property boasts seating for 70. The bar area has a stage for entertainment and access to an outside patio. The main room has a full length concrete bar designed for buffets or a unique Taco bar. There is also plenty of space for dancing and large gatherings. The complete kitchen is well equipped and has numerous appliances including a large pizza oven. Guests can relax in the dining room that has been screened in for maximum comfort. In the center of the dining room as you enter is a large fountain. Clean and renovated washrooms are located between the bar and dining room. Beside the main building is a two storey that has 2 suites for rental as well as another room downstairs. There is also a storage bodega and washroom. This building has its’ own entrances and is ideal for rental to tourists and visitors. The back of the driveway has an aluminum building designed for a shop or for extra parking and storage. Beside this area is a large dog enclosure that clients pets can use while visiting Included in this sale is a lot size of 12,000 meters. Follow the jungle path from the back of the main building and you will find ample room for more buildings or cabins or a main residence. This lot is also a nice flat area up top with a separate street access and great views of the surrounding mountains. There is so much to this viable business and is ready to go immediately for the new owner. A growing clientele awaits you and is a popular destination for local expats and visitors. If you are looking for a new opportunity or seeking a fabulous location for your new domicile or retirement, the area around the village of Ojochal is the place for you. This quaint village is known for its’ incredible selection of restaurants with various types of cuisine. Some call it the “Culinary Capital of Costa Rica” and truly has something for everyone. North of Ojochal is the commercial center of Uvita with banks, grocery stores, salons, pharmacies, service stations, and a medical center. The Southern Zone is a spectacular part of Costa Rica with numerous pristine beaches and the gateway to the Osa Peninsula. South of Ojochal you will find a new golf course, a brand new hospital in Cortez, and the site of the new proposed international airport that has all government approvals and getting ready to proceed. This part of Costa Rica is fast becoming the hotspot with some of the most scenic views and property, beaches, and services for visitors and residents alike.